Quality Assurance Reference from C.H.I.P.S. 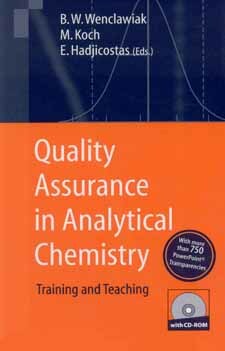 Quality Assurance in Analytical Chemistry second edition has been completely revised and enlarged. In particular the chapters on measurement uncertainty, calibration and validation are practically all new. This book provides an in-depth but easy to understand coverage of quality assurance for chemical measurements. This includes both internal as well as external quality assurance, necessary statistics as well as total quality management. All this is presented with more than 800 commented slides, which are also provided as downloadable Extra Material. The book iss an advanced textbook for analytical chemistry students and professionals in industry and service labs and as a reference text and source of course materials for lecturers. Accreditation or Certification for Laboratories?